The AIM NetworkAIM ExtraThe F1 Race In Melbourne BEFORE The Formula 1 Race! The F1 Race In Melbourne BEFORE The Formula 1 Race! 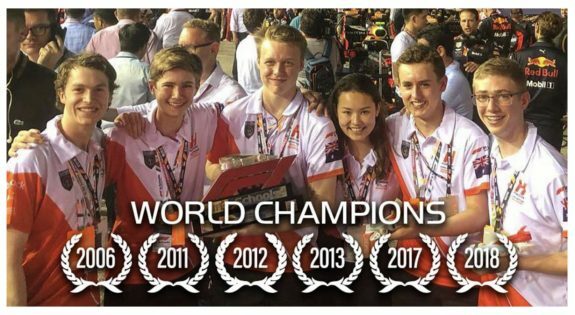 Australia’s top teenage race car designers and ‘drivers’ are preparing to arrive in Melbourne to do battle in the days leading up to the Formula 1 Australian Grand Prix…in the 2019 F1 in Schools National Final. These 36 teams from across the nation are some of the 40,000 high schoolers who participate in the world’s biggest STEM (science, technology, engineering, mathematics) competition [globally more than 9,000,000 students from 17,000 schools in 50 countries are involved]. The students used complex 3D computer software and special applications like virtual wind tunnel testing to design futuristic miniature F1 cars which rocket from 0-80 km/h in 1 second. They collaborated with industry to learn about materials, engineering processes and production techniques. Teams invested hundreds of hours in order to qualify for the National Finals – working after school, in their evenings, weekends and during their holidays. The Formula 1 teams are patrons of this program and at each World Finals they donate car components to be used for category trophies. They will open up their pit garages at Albert Park to the students, following the National Finals, and the young teams will also meet their heroes such as driver Daniel Ricciardo. Australia has become the dominant force. Our report card includes six world championships, five seconds, three thirds, eight Best Engineered Car Awards and three international speed records. Not only are these competitions great fun and incredibly stimulating, the F1 teams (and those from other categories) are more than a little interested in these competitions – they know that their next generation of racing car designers are already getting hugely valuable experience by participating and they will choose the best and help develop their career path. They know that one day, they will recruit the next Adrian Newey or John Barnard this way. Clearly, there are not 9,000,000 jobs in F1, but for those harbouring the dream (as I once did, although it was never realised – but this sort of thing didn’t exist when I thought about a career in engineering 40 or more years ago) of getting into professional racing as a designer, these competitions are excellent grounding. For those that are not quite able to reach F1, even V8 Supercars offers careers as engineers.